All Circle City Copperworks conductor heads are fully soldered watertight and available in 16 or 20 oz. copper. We also have lead coat copper available. 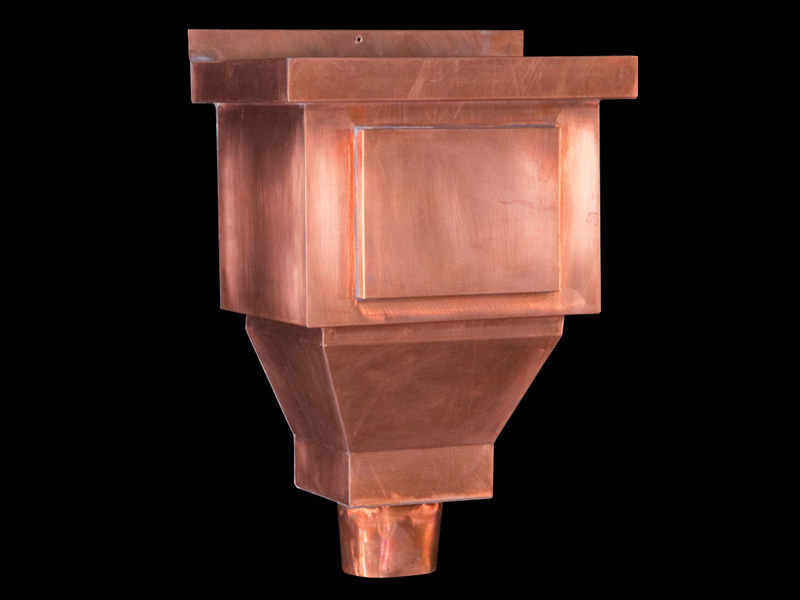 Our copper conductor heads are all custom fabricated to any size, design, and specification. Since our copper conductor heads are custom made by hand, they are expensive to lay-out and fabricate, especially if the quantity is small. You may be able to find standard profiles with standard sizes through other company’s websites. The below pictures are examples of copper conductor heads that we have fabricated in the past. Some of these may be similar to other company standard profiles, but were requested by customers desiring custom sizes not available by others. Call, fax, or email your desired design and dimensions for a copper conductor head quote. 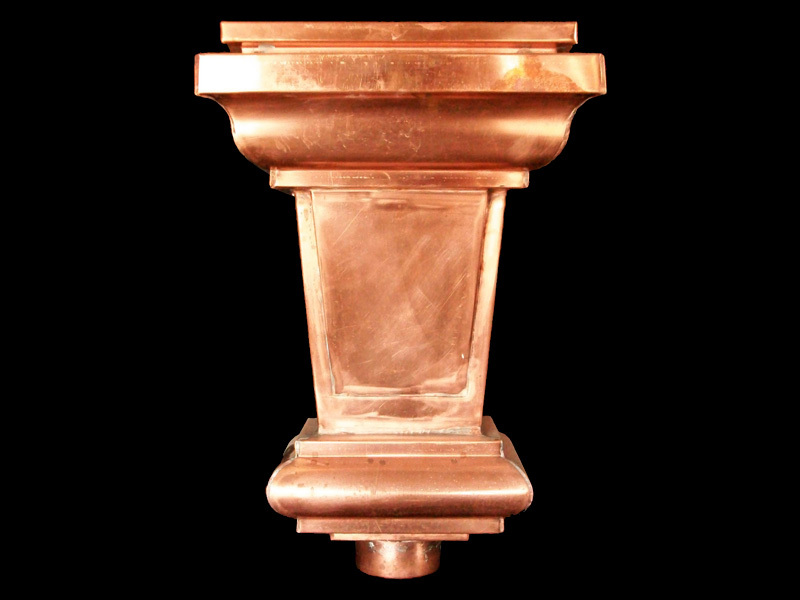 This Copper Conductor Head or Leader Head is a classic treasure that was manufactured to maximize the aesthetics of a prominent home here in Indianapolis. It was made using 20 oz. pure American copper. It is about 14” wide and 20” tall. Leader heads are also available in 16 oz. Copper. We can patina any of these green, so you don’t have to wait for it to turn on its own. Please call for any custom sizing and patina quotes. 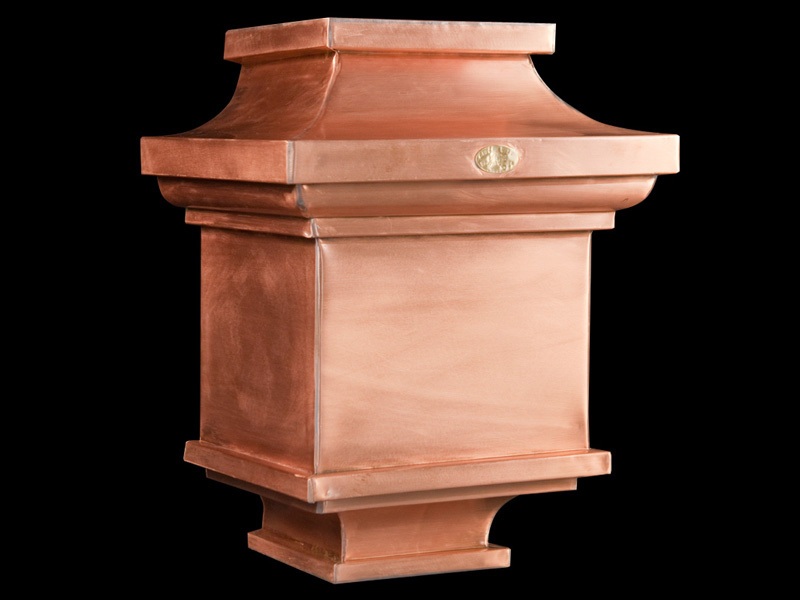 This Copper Conductor Head or Leader Head was made for a personal residence of a well-respected roofing contractor. It was made using 20 oz. pure American Copper. It is about 16” wide and 24” tall. Leader heads are also available in 16 oz. Copper. We can patina any of these green, so you don’t have to wait for it to turn on its own. There is an additional fee for patina. This Conductor Head or Leader Head is something we did in house for our show pieces. It was made using 20 oz. pure American copper and is 14” wide and 20” tall. Leader heads are also available in 16 oz. Copper. We can patina any of these green, so you don’t have to wait for it to turn on its own. There is an additional fee for patina. Please call for any custom sizing and patina quotes. 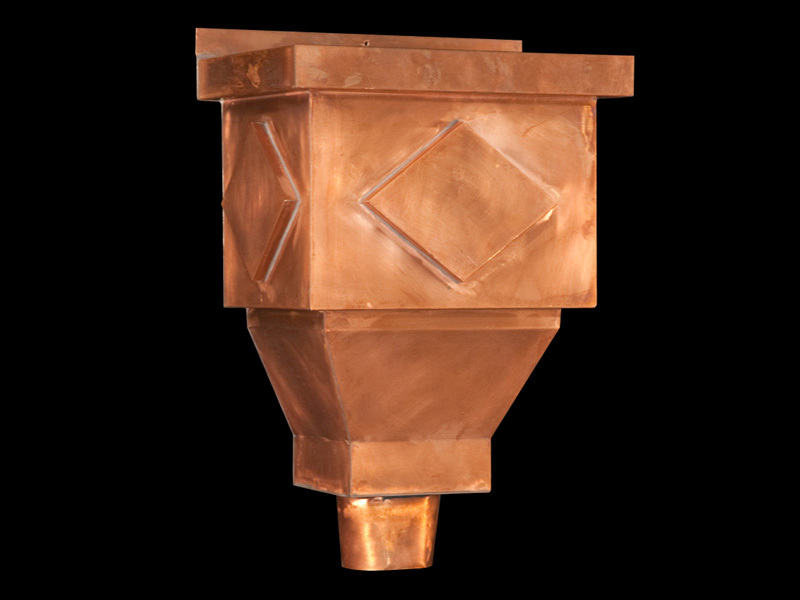 This Copper Conductor Head or Leader Head is just the reverse of the one above, but has a different top trim at the top. This is to show how we can change just about any design to fit your style. It was made from 20 oz. pure American copper and is 14” wide and 20” tall. Leader heads are also available in 16 oz. Copper. We can patina any of these green, so you don’t have to wait for it to turn on its own.